For all the old buildings that slowly fall into disrepair until they are torn down (or just wither away), one local landmark will experience a happier fate as part of the development of Zingerman’s Cornman Farms in Dexter. Alex Young, Managing Partner at Zingerman’s Roadhouse and the driving force behind Cornman Farms is working with local architect Charles Bultman to rescue the barn on his recently acquired property on Island Lake Road in Dexter. As the project begins, it might look to passers-by that the barn is being torn down, but that is not the case. Instead, the barn will be dismantled, piece by piece and every salvageable item will be tagged and shipped to a barnwright in Ohio, Christian and Son, who will begin the painstaking process of rebuilding the grand structure. History is told in retrospect, and often with great struggle to try to sort fact from fiction. Witnesses to many significant events can seem to not have the same experiences, as evidenced by accounts that sometimes vary wildly. But then these events are rarely cued up for us, and they do occur in real time, which can be faster than we might want to admit. Some events however can come at us slowly and deliberately. And if we don’t stop to acknowledge them they pass in a flash. One such event begins this week in Dexter. 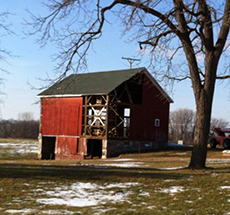 A barn that has stood in service to its Dexter farm since Dexter was founded, pre-dating the Civil War and possibly Michigan’s statehood, is going to be dismantled. To those of us who bring buildings to life, these moments give us great pause. As best we know right now, this barn has graced its property since the founding of Dexter; the adjacent house is said to have been built in 1834 and the barn either pre-dates that, or followed right after. Regardless of the date, this barn has been a landmark on Island Lake Road for generations and will be gone for the first time since the early 1800’s. 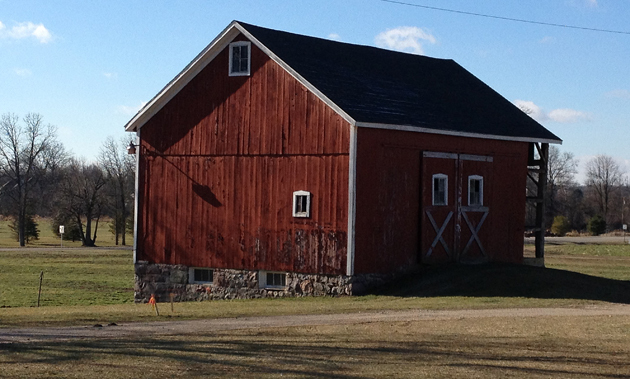 Bultman also notes that the case of barns is a special one in the world of historic preservation. Sadly, most barns are not afforded this opportunity. Their descent is not interrupted and they languish; slowly decaying and sinking. This too should give us great pause, but it rarely does, due to the relentlessly slow pace of the decline. But the work that begins this week and continues in the coming months will bring great change to the barn and the farm. And these events will highlight the fact that there is so much that is valuable and interesting in these old structures and that they can, and should, become as important in our future as they have been in our past. The entire project is expected to last into the summer of 2014. The barn will be refurbished and brought back to its site, where it will be re-raised in approximately the same location it has occupied for well over a century. 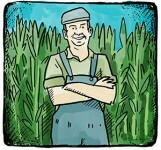 It will then begin its new life as an integral part of Zingerman’s Cornman Farms and will be the center of food celebrations for decades to come. 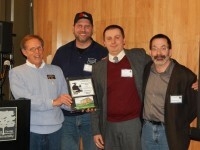 Cornman Farms Wins Barn of the Year Award!